For the best snorkeling in Hawaii, and best snorkeling beaches, you need look no further than the Big Island, and in particular the Kona coast. Brilliant coral reefs, deep underwater crevices and lava tubes, an incredible variety of fish, sea urchins, green sea turtles and other interesting creatures lie just below the surface. With our calm, crystal-clear blue ocean waters, the most rewarding Hawaii snorkeling adventures are right here on the Big Island. Is this your first time snorkeling? We can help! Click here for a basic snorkeling lesson. 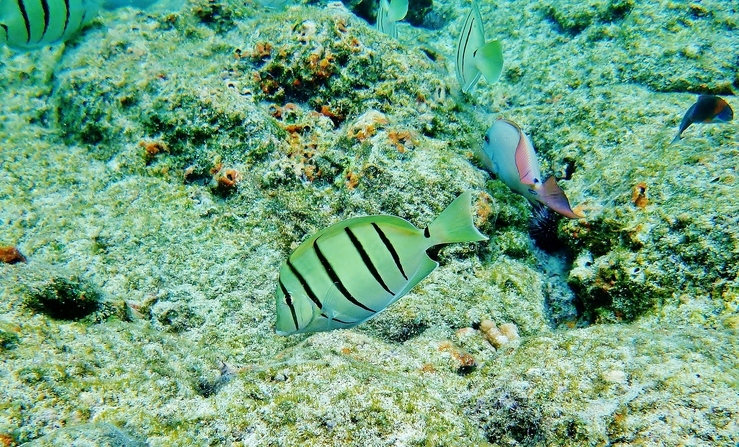 Check out some of our favorite snorkeling spots, or sign on for a Big Island snorkel tour. The ocean that surrounds the Big Island has a stunning clarity. Water clarity is impacted by the presence of sediment and organic particles in the water. The Big Island's coastal reefs help limit water turbidity, and lack of nutrients limits the growth of algae and phytoplankton (microscopic plants) commonly found in the coastal waters of mainland beaches. The result is a visibility unparalleled throughout much of the world. Even if you've never snorkeled, snorkeling Big Island is a perfect place to learn because of the calm, clear and warm ocean just off the west coast of the Island. 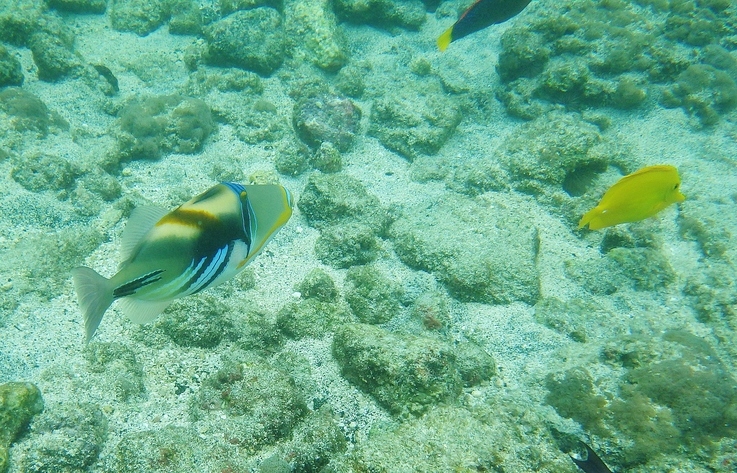 Snorkeling in Hawaii can be as simple as renting a mask, fins and snorkel from any of the local rental shops. Keep it in your car and go whenever the mood suits you. We like to bring our snorkel gear along anytime we're near the shore, just in case. Snorkeling in Hawaii often means swimming in areas where coral is prominent. Keep in mind that coral is a fragile, living organism (actually an invertebrate animal) that is a critical component of the ocean ecosystem. When swimming in and around coral, make every effort to avoid stepping on, touching or drifting into it. If you need to stand up to clear your mask, try to do it in an area where you won't risk stepping on and damaging the coral. Oils from your skin and certain sunscreens can kill the coral polyps. 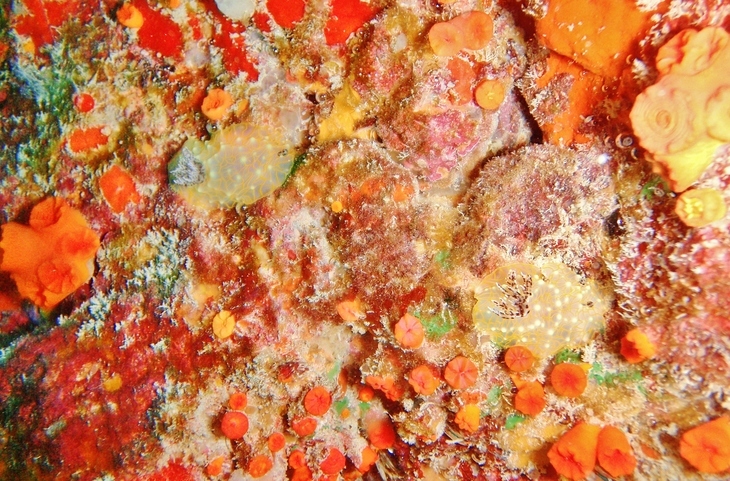 Most of today's popular sunscreens are not reef friendly. Anytime you are snorkeling in Hawaii, try to use a sunscreen that is biodegradable and mineral-based or even labeled "reef safe." Our favorite Hawaii snorkeling spot is Kealakekua Bay adjacent to the Captain Cook Monument. 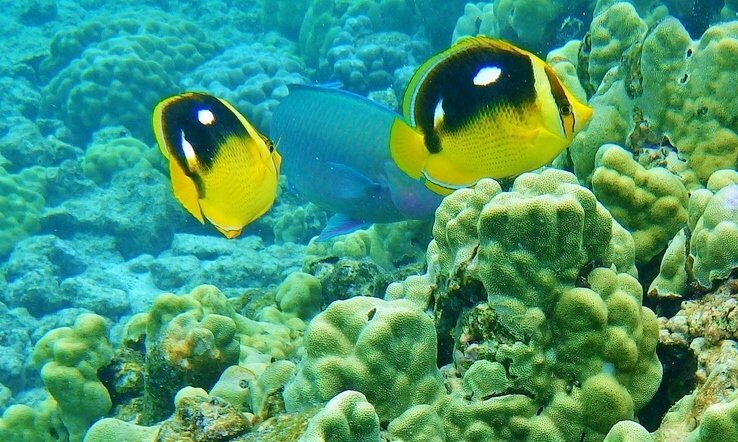 For ease of access and excellent Big Island snorkeling, check out the reef and bay at Kahalu'u Beach Park. Though deeper, Two Step at Honaunau Bay adjacent to Pu'uhonua o Honaunau can be almost as nice as Kealakekua when conditions are right, particularly on a clear, sunny day. The shoreline adjacent to the tiny town of Puako, 40 minutes north of Kona, has a phenomenal reef, especially popular for diving. More experienced snorkelers will find excitement in Pawai Bay north of the Old Airport Beach. Pawai Bay is not the easiest snorkeling spot to reach but worth the effort for advanced snorkeling. 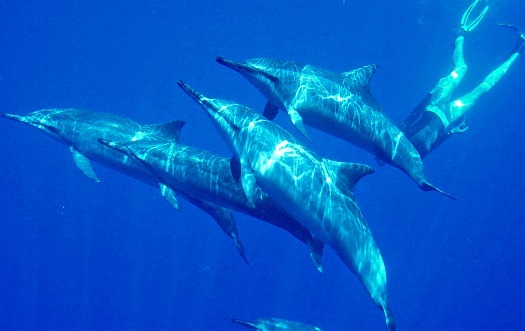 Many of the bays along the Kona-Kohala coast are frequented by dolphins, particularly in the early part of the day. 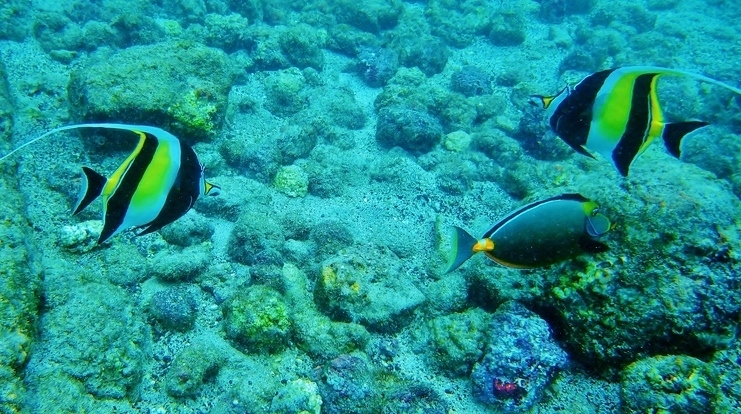 If you are lucky, you might find yourself snorkeling with them. Several companies offer exciting boat tours. We particularly enjoy the 4-5 hour Zodiac Raft and Snorkel Adventure to Kealakekua Bay and the Captain Cook Monument. A maximum of 16 guests per boat make this a much more personalized experience than many other commercial tours. Their rigid hull inflatable boats will speed you across the open ocean from Honokohau Marina north of Kailua-Kona, stopping to snorkel at Kealakekua Bay. With a knowledgeable and friendly captain, this ride is a real hoot! The trip follows the coastline, exploring sea caves and lava tubes. All equipment, beverages and a picnic snack are provided. 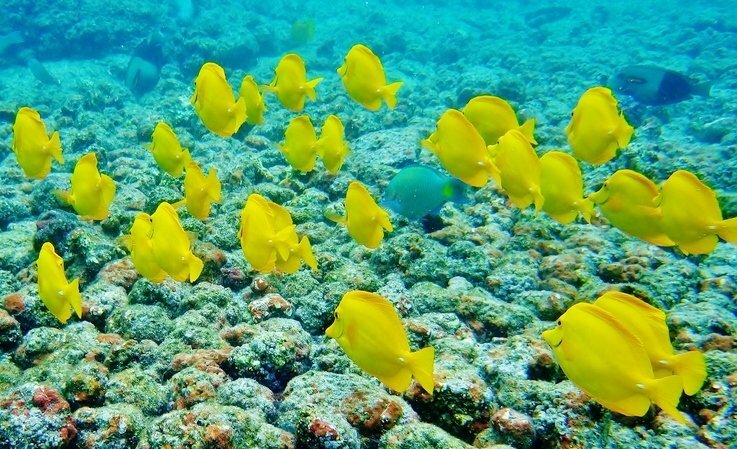 Another fun option is this 3.5-hour afternoon Kealakekua Bay snorkel tour that departs from Keauhou Bay at 2pm. Cruise along the Kona Coast to Kealakekua Bay aboard this double-deck catamaran with its own waterslide and other amenities. For a more deluxe snorkel tour to Kealakekua Bay, this 4.5-hour catamaran tour from Keauhou Bay includes a tropical breakfast and BBQ lunch, with plenty of time to enjoy the waterslide while exploring the underwater world of Kealakekua Bay. For an absolutely out-of-this-world experience, join us for a Manta Ray night snorkeling tour. Watch these graceful creatures dance under water like "Butterflies of the sea." Snorkeling or diving with Manta Rays is the highlight for many people visiting Hawaii. Tours are available nightly from various locations along the west coast of the Big Island. First time snorkeling in Hawaii? Relax. If you are snorkeling for the first time, breathing with your face in the water can be a strange sensation! Relax, take your time, take a few deep breaths, and before you know it you'll be having the time of your life! Before putting on the mask, wipe the inside of the lens with an anti-fogging solution, available at any dive shop. Or if unavailable, you can spit into the mask and wipe the lens with your own saliva. Then submerge the mask to fill it with water, wait a few seconds and pour the water out. Avoid resting the mask on your forehead, as this will cloud the lens. Press the mask lightly to your face, breathing in through your nose to create suction. You should be able to feel the mask sticking to your face without holding onto it. Pull the strap over the back of your head. Before heading out, stand in shallow water near the shore and breathe normally through your snorkel with mask on. Gradually place your face in the water and continue breathing normally through the snorkel. Continue as long as necessary until you can breathe without gasping for air. Remember, relax! 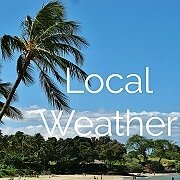 Stay alert and use caution whenever snorkeling on the Big Island, as currents and conditions can change quickly. It's also a good idea to invest in a cheap pair of water shoes to get around on the rocks.